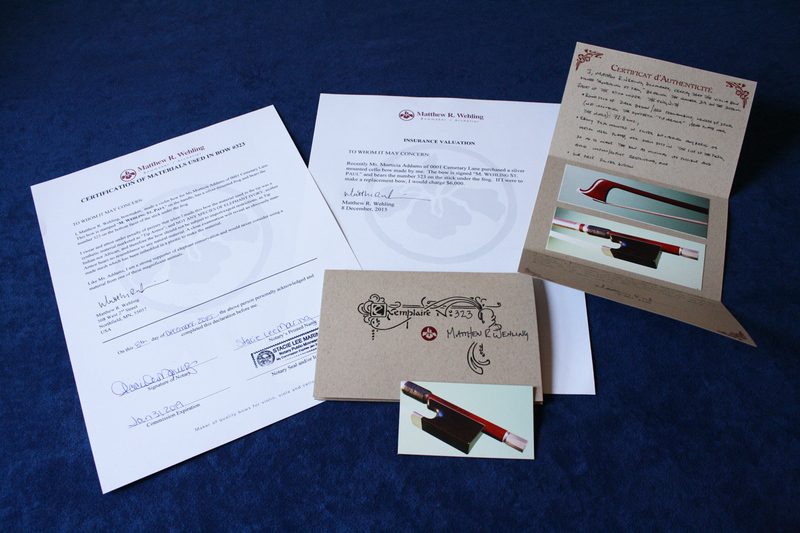 Matt will be happy to provide insurance valuations, notarized certificate of materials included in your bow, and deluxe handwritten certificate of authenticity, upon request. Bows mounted in silver create an elegant look and are made of very high quality materials. Matt Wehling uses aged pernambuco wood from Brazil, which has a deep reddish-brown color and unique textural patterns. He uses only Parisian silver, which has a higher compositional percentage, giving it a warmer sheen than silver available in the U.S. Furthermore, Wehling constructs the frog from top quality ebony and carefully selects portions of awabi shell that produce the most brilliance. 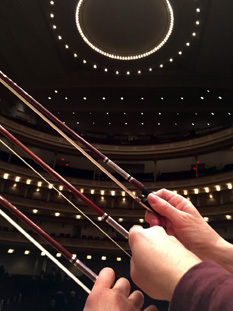 A well-playing bow made from fine materials – Wehling receives the most requests for this type. Bows mounted in gold have an even more distinguished character because their materials are of an even higher quality. Following the philosophy he learned from his French masters, Wehling reserves the best of the best, the crème de la crème of his materials for his gold bows. His finest pernambuco goes into these bows, which is visually more beautiful and capable of producing spectacular tone. The warm French gold in addition to choice ebony and select awabi shell round out the superior materials that make up this type of bow. Requiring the most time for construction, this is a top of the line bow for players seeking to match their playing style with the absolute best.